Acquired by music mogul and rapper Jay-Z, the high-definition music streaming service called Tidal is gearing up for its official re-launching after change of ownership. The service will make its re-launch later today by, according to reports, making a move for snagging the new releases of the some of the most notable and biggest musicians at the moment including Madonna, Kayne West and Daft Punk, before the releases will become available at competitors like Beats and Spotify. Invites have been sent out by the company for a press conference that will be held today in which an announcement will be made by Shawn ‘Jay-Z’ Carter. The rapper will express their commitment to taking the music industry in a new direction from the both the business and creative point of view. While not many details have been released officially, the unofficial mill has reported that the event will be used by the company for confirming the first major and big-name artists that will be using the Tidal platform exclusively for streaming music. The question is what those artists will be doing on the service? Clearly, this deal is not just a regular streaming one. 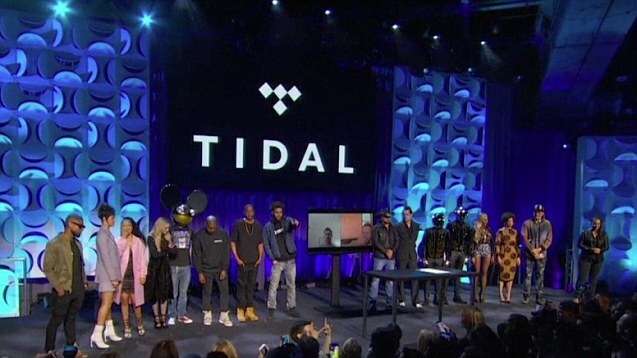 It was reported by some close sources that the plan of attack of Tidal included signing first-window deals with the artists. These deals would mean that the streaming service would be able to get the first releases of songs from major artists before any major digital streaming service could. This exclusive deal will be followed for only a short period as these tracks will eventually be available on Deezer, Spotify and other services. This is highly similar to the way services like Netflix only get movies after they have been shown in cinemas and been released on DVD and consequently Vessel is attempting to break this cycle. Those who keep track of music news or follow musicians on social media networks will not be very surprised to learn about the list of stars joining Tidal as it includes several big-name musicians like Beyonce, Kanye West, Calvin Harris, Arcade Fire and Madonna. They are using the hashtag #tidalforall on Instagram and Twitter and have even changed their profile to a turquoise blue color for sending the message of their support to the service. Last week, even Taylor Swift’s catalog was added to Tidal, even though there was no sign of the 1989 album. While this deal isn’t exclusive, but has laid down groundwork for the country singer’s music to come to the platform first. Why are artists willingly joining Tidal? Some part of it has to do with Jay-Z. A long list of musicians work with his Roc Nation agency for providing management, publishing, label and other services and Tidal has become just another step for the agency to become a one-stop shop for music distribution. Apart from that, the streaming service is also offering some attractive terms as opposed to others including payouts double of what rivals are paying. This could be the cherry that Tidal needs as artists are complaining that they don’t get enough returns because of digital music.